Need Fake Friends For Your Wedding? In S. Korea, You Can Hire Them : Parallels Baby showers, weddings, even meet-the-parent weekends don't have to include your actual loved ones, at least not in South Korea. A cottage casting industry exists to help fill your life-staging needs. A stage production or a Korean wedding? It can be hard to tell. Weddings and baby showers are real-life milestones to spend with your actual loved ones. True, but in South Korea, a cottage industry exists to help real people find fake friends to fill seats at such life rituals. At a recent wedding in June, Kim Seyeon showed up as a guest even though she is a total stranger to the bride and groom. She makes about $20 per wedding she attends as a pretend friend. "When it's the peak wedding season in Korea, sometimes I do two or three acts a day, every weekend," Kim says. As a role player, she's part of an agency that casts her to attend weddings all over the country. At this wedding, at least 30 of the guests are getting paid to fill the seats. "It's fun. A lot of the times [couples] need these guests because they want to save face," Kim says. "They're conscious of what others think, and they need more friends. So the brides are very thankful for my presence." Rent Venues, Why Not Guests? 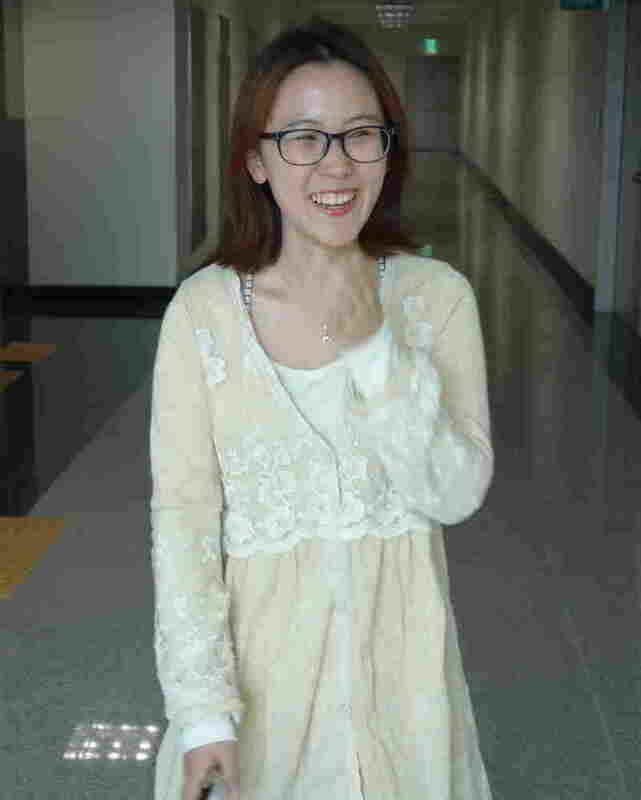 Kim Seyeon is a college student and a professional role player. She's attended about 70 weddings in the past 18 months, as a hired fake guest. At this particular ceremony, neither the bride — who hired Kim — nor the groom — who doesn't even know there are fake guests at his wedding, noticed an NPR reporter in the crowd. I suppose you could call it wedding crashing, but I just blended right in with the other unfamiliar faces. 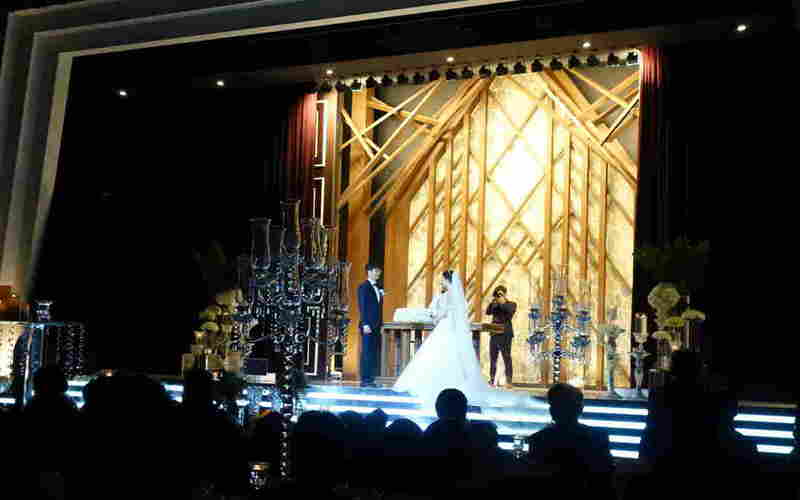 The logic in South Korea is this: You can rent chairs and venues for weddings — why not guests? "Wedding guest rentals started in the late 1990s, and in the early 2000s, broader role-playing rentals began," says Lee Hyun-su. He runs a South Korean casting agency called Role Rental 1-1-9. He keeps a database of 20,000 actors, ages 21 to 70, whom he places to work in real-life situations. We're talking fake bosses, fake parents, fake mistresses. Lee has cast them all. "This year we've seen increases in the other types of rental requests [like] renting family members, boyfriends, girlfriends, lovers or office employees. There have also been times when people hire fake spouses to get a loan from the bank," Lee says. While it may seem strange to have actors in what are supposed to be real-life rituals, performance artist Maria Yoon — a Korean-American — "gets it" after experimenting with the artifice of weddings with an art project a few years ago. She staged 50 different wedding ceremonies to play on the idea that all weddings have a performance aspect to them. She just fears that the Koreans are taking the dishonesty too far. "Koreans have this nunchi," Yoon explains. Nunchi describes a type of interpersonal understanding of yourself versus your peers. "If you have a fancy car, it has to [be] a fancier car than your neighbor, so you can tell them how much money you make," she says. "As I get older, life is too short for you to make your neighbors happy. You just have to be happy yourself." "The wave of competition unleashed in South Korea since the economic take-off in the 1960s has brought about a crucial change. Now, according to Hwang Sang-min, a professor of psychology at Yonsei University, Koreans feel impelled to achieve an image of perfection rather than mere respectability and to be seen as doing not just well but better than others. A kind of 'face inflation' has taken place. ... People construct about themselves the public image of a perfect person and then somehow they must live up to it. A word that has great currency in Korea today is jalnancheok, or 'pretending to do well.' "
Back at the wedding, it's clear the need to impress keeps the guest rental business going strong. The whole event feels more like a cruise ship production than what Americans might be used to. There are musical numbers. There are skits. There's even a solo sung by the wedding emcee, who is a different guy than the officiant. Somewhere in all this song and dance, a couple got married. The pomp and pretending may seem strange for first-timers, but our agency role player? She's a Korean wedding veteran, sitting quietly in the back, with a blank expression on her face. "I had fun, but it's not the type of wedding that I want," Kim says. Our actress has a her real-life wedding coming up, with her actual fiancee. When I asked her whether she'll hire some fake guests for her wedding, she says no. "I don't even think I'll have a wedding in this country," she says. Here, a wedding can be a lot more than just a celebration of love. It can be the most elaborate of stage productions. HaeRyun Kang contributed to this story. To follow behind-the-scenes reporting in East Asia, check out our Tumblr, Elise Goes East.